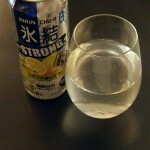 Review: Kirin Chu-Hai Lemon STRONG | Oyatsu Break! Chu-Hai is Japanese shochu, a distilled alcohol made of barley, sweet potatoes, or rice (usually the latter two), made into a highball or cocktail with carbonated water and flavoured with something else like lemon, grapefruit, or cherry “juice.” At a bar you’d mix shochu with juice or tea, but when you buy it in a can (at your local convenience store or vending machine) it’s carbonated with a fruit flavour, sort of like alco-pop. It’s harsh as all hell, too. Seriously, buying a can of Chu-Hai is often like settling in to drink a can of burning citrus cleaner. Until you get used to it, then it’s AWESOME. Seriously, it’s a cheap (cheap!) alcohol flavoured with sugar and a bit of fruit flavouring, and it’s a hell of an acquired taste, but once you get a taste for it you’ll wonder how you ever did without it… and then you’ll miss it for the months/years in between your trips to Japan because it’s not available in Toronto. 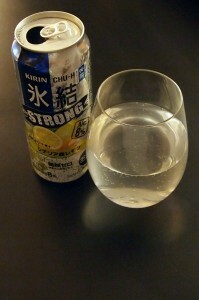 For my first Chu-Hai review, we’re going to grab my favourite brands, Kirin Lemon Extra Strong Chu-Hi, picked up on a recent trip to Japan by my friend Becca. Packaging: Loooooooooooove the Kirin Package design. The best Kirin products have an awesome textured triangle/diamond packaging that makes them easier to grip, catch your eye on the shelf, and basically look awesome, and this does too! It has basic English declaring it CHU-HI and STRONG and ALC. 8%, though the flavour of this particular beverage isn’t written on the can, we just have an illustration of a lemon… which is actually pretty problematic. Lemon, Yuzu, and Grapefruit can all look preeeeeetty similar depending on who illustrates it, and particularly when you’re buying ‘off-brand’. 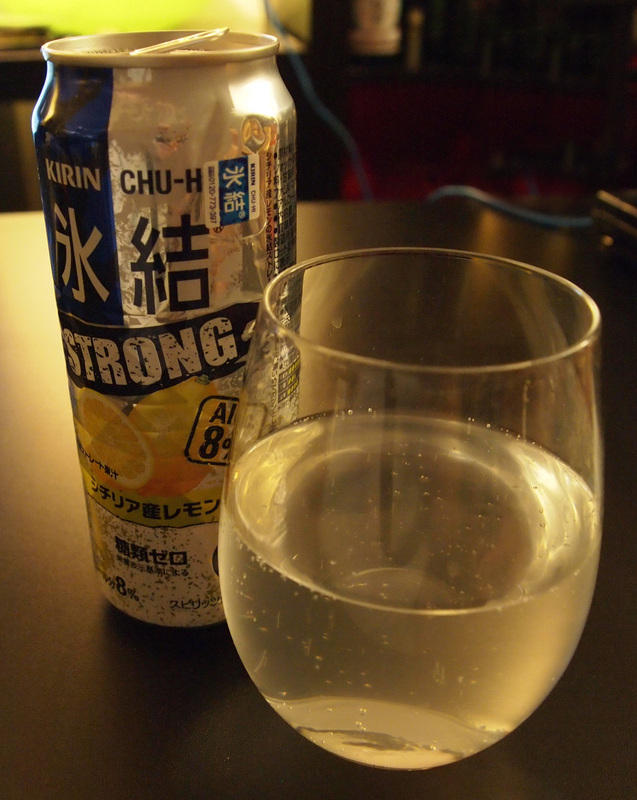 I’ve been surprised by the flavour of cracking into a Lemon Chu-Hi and getting a sour grapefruit more than once. Learn to read “lemon” in Japanese folks. Learn to read it while you’re already drunk for optimal performance. Something I’ve never done before: The scent is a lot less offensive when you pour it into a glass, as you don’t get that metallic smell from the can, and that really does affect the taste. Taste: The taste is very different between drinking it out of the can and drinking it out of a glass. Again I think that’s mostly the smell though, as the can really smells harsh and metallic, and it helps you pick up… heh… all of the harsh, chemical, metallic flavours in the chu-hi. It’s not a positive thing. It makes me wonder about just how much this pretty can affects the flavour of what I’m drinking all the time. Still though, drinking this while sitting on the street with your friends in Tokyo? You’ll put up with a bit of metallic flavour. Verdict: Not much of a surprise if you read the opening, but I do love me some Chu-Hi. Given the choice I’d normally take the regular brand of Kirin Lemon Chu-Hi over the strong, but given the scarcity of this sort of booze and drink on this side of the Pacific I was overjoyed to enjoy these two cans over the course of this review… Now to go back to silently yearning for another can. 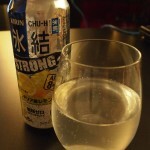 Pingback: Review: Kirin Strong Sour Cherry Chu-Hai 8% | Oyatsu Break! I drank the hell out of these while I did a UDP to Japan… where can I find them in the states? When the pickings are limited, I usually go for a strong grapefruit or lemon, I can t stand the fake sugar flavor of the ZERO flavors though. I recently tried Sangaria Greapfruit Chu Hi, it was very easy to drink and was pleasant to consume. Its a traditional Chu-Hi made from Sochu. at 6% alcohol I could drink several of these in quick progression. but, I prefer to have a can with my meal on the rocks or in a super chill mug. I have also tried J Pop can chu hai in a bottle by Takara Sake. I am not as impressed by this as the Sangaria one. also, the Takara one is made with vodka, not a real chu hai. I also did not like the flavor profile, and it was very lightly carbonated compared to the Sangaria one.